Via Rail wants you to see your loved ones for the Holidays. If you had $2,500 to spend on a trip across Canada, who would you want to see? Maybe it's about bringing someone home. Come down and show your holiday spirit. 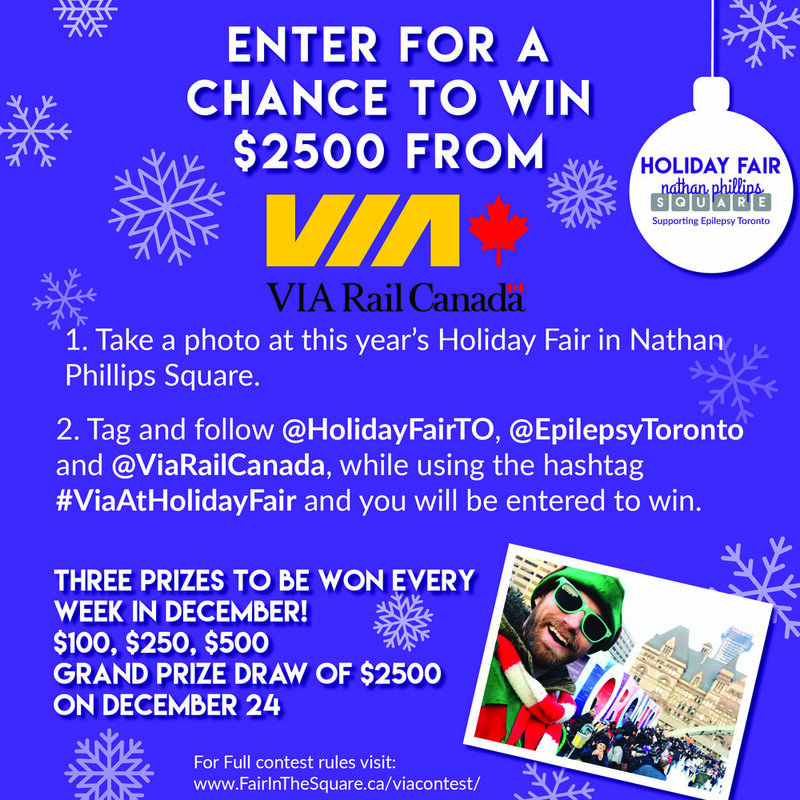 Post a selfie or image from the fair, tag and follow @HolidayFairTO, @EpilepsyToronto and @viarailcanada on Instagram and/or Facebook, and use the hashtag #VIAatHolidayFair. Your name could be chosen at random, for one of three weekly prizes ( $100, $250 and $500 gift card from Via Rail) OR ONE GRAND Prize of $2,500 awarded at the end of the event. Are non-transferable or redeemable in cash. Valid for a period of 12 months beginning January 1, 2019 and cannot be extended. May be booked as tickets with VIA directly, either by telephone or at a station and are subject to seat availability. May be applied against train tickets or any other VIA travel product (such as Canrailpass or Bizpak), with the exception of on-board train services (such as meals). When applied to a ticket of lesser value, the unused portion of the travel credit will be lost.